Evelyn Arthur St John Waugh was born in Hampstead, son of the critic and publisher Arthur Waugh (1866–1943). He was educated at Lancing and Hertford College, Oxford. He studied art for a while and taught in private schools. His first novels, Decline and Fall (1928) and Vile Bodies (1930) established his reputation as a very amusing satirist of fashionable upper-class English society. Black Mischief (1932) is an unkind comic treatment of Abyssinia, which Waugh visited in 1930. 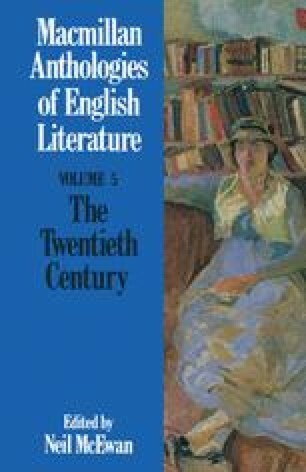 A Handful of Dust (1934), a bitter, only intermittently funny novel, was followed by When the Going Was Good (1946), a collection of Waugh’s travel books of the 1930s, and Scoop: A Novel about Journalists (1938). Waugh had become a Roman Catholic in 1930. His religious convictions first became conspicuous in Brideshead Revisited (1945). The Loved One (1950), a satire on the luxurious vulgarity of cemeteries in California, increased Waugh’s reputation and so did the three entertaining volumes of Sword of Honour (1952, 1955, 1961); based on Waugh’s army service, they follow the fortunes of an old-fashioned Catholic gentleman in the Second World War. Among his later books, The Ordeal of Gilbert Pinfold (1957), in which he satirised himself as a pedantic author sheltering in the role of a crusty country squire, is the most attractive.